WordPress Themes in 2014 – Which Theme Suits You? In WordPress, themes are a set of files that render the content of your site to the user. Right from the layout of your posts to the position of the sidebar(s), everything is decided by the theme files. A theme can be thought of as an outfit of your website- something that gives a look to it. The core wordpress files do the main calculations and decide what to show and the theme shows you the content that is generated. It is generally seen that websites are not perfect because of the wrong selection of the themes. After all, a proper outfit is necessary for a top class site, only then it would look perfect. 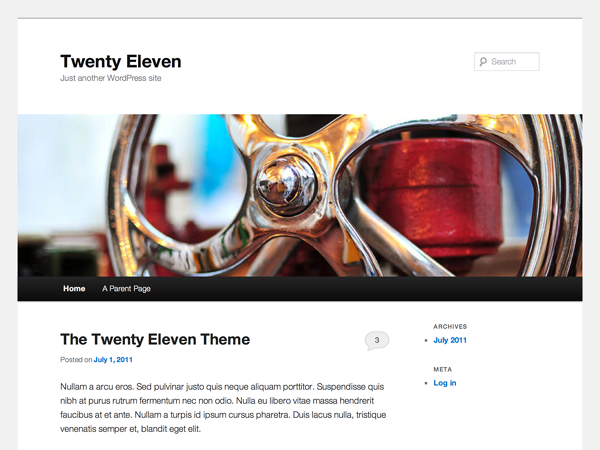 Take for instance the default twenty eleven theme of WordPress. It has a huge banner on the top, which is present for just representative purposes and quite unnecessary for most of the blogs. The next question arises- where do you find themes? Firstly, the themes part of the official website of WordPress has a huge collection of themes. As of mid 2013, it has over a thousand themes to choose from. The WordPress site also provides many commercial (paid) themes under the paid services section. Do notice that commercial themes have a better support in general. 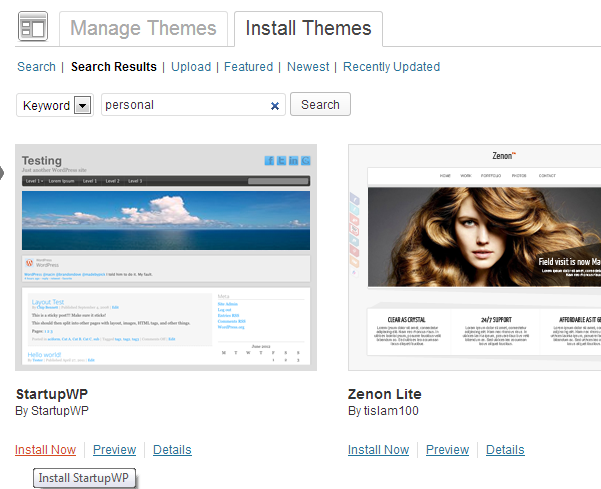 Installing a theme in WordPress is very easy, easier than installing WordPress itself. There are two ways in which you can install themes in WordPress. The first way is to search and install it through WP Admin, however, only official themes listed in WordPress.org would be available here. 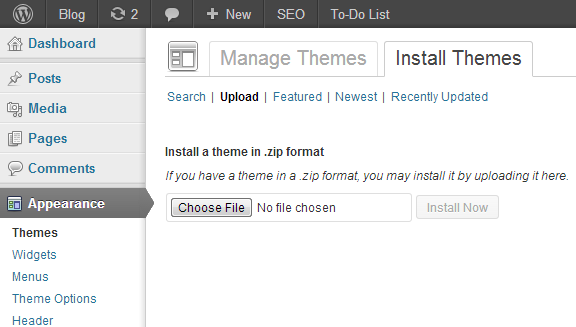 The second way is to download the zipped theme file and upload it to WP Admin. 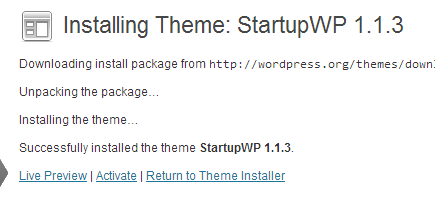 To install it through WP Admin, go to Appearance > Themes and click on the Install Themes tab. It has a pretty advanced layout for you to search for themes. After searching for a keyword, click install on any of the themes that you want in your blog. After you select a theme, it gets downloaded an installed. Click on ‘Live Preview’ to check how it looks in your blog. If you think you like the preview, click on ‘Save and Activate’ to save the plugin. The other way of installing WordPress themes is to upload the zipped file of the contents in your WP Admin. Go to Appearance > Themes and click on ‘Install Themes’ tab. Click on ‘upload’ from the top options. Click ‘Choose File’ and select the zipped file and click ‘Install Now’ to upload and install the theme. Check the live preview if you want and apply the changes if you like them. For your convenience, I have handpicked a few themes, which I would describe in detail. Remember, one theme may be really good for one site, but it might be disastrous for some other site. The theme of a site goes hand in hand with the nature of the posts in it. This theme is for the those who are fed up of the ruckus of most modern websites and need something minimal for their site. 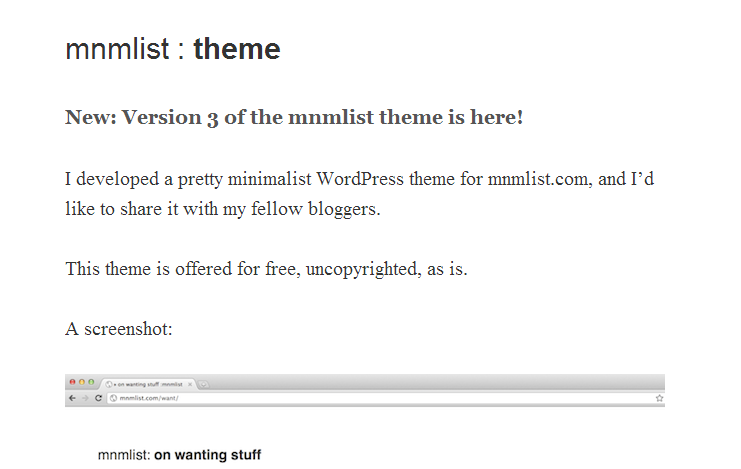 The mnmlst theme has been stripped to its bare essentials, which focuses only on the content. There is no header, no sidebar, a minimal footer, no widgets and no comments. Very fast rendering of pages. No distraction from the content. No widgets mean that integration of social networks would be tough. Blogs and websites which focus solely on the content being written and do not care about reactions of the readers, or people who want some peace of mind with an uncluttered design must use this theme. Note that this theme is not for websites like travel blogs or photography posts which involve a lot of images. If you are planning to showcase your work, this theme would not work for you. 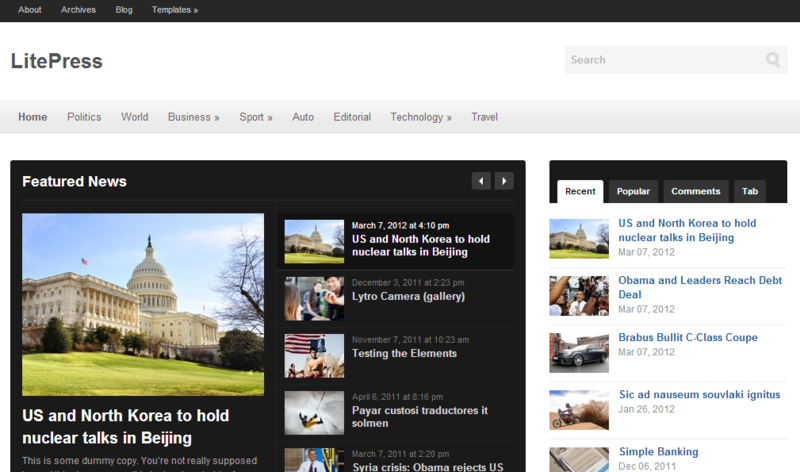 LitePress is a simple but powerful theme with responsive design, good for news-like websites. It involves a slideshow on the homepage of featured news with snippets. The responsive design ensures that the site renders properly to users viewing it on any device right from a full HD monitor to a smartphone with a relatively little screen. Responsive design- makes it accessible to all users. This theme would be great for you, if you associate every post with at least one image. The featured news section provides a chance to you to showcase the most important posts. Any news related blog would benefit a lot from this layout. This is one site which would work out really well for a portfolio. This theme has a Pinterest-like infinite scroll feature which would go on displaying as much of content as you have. 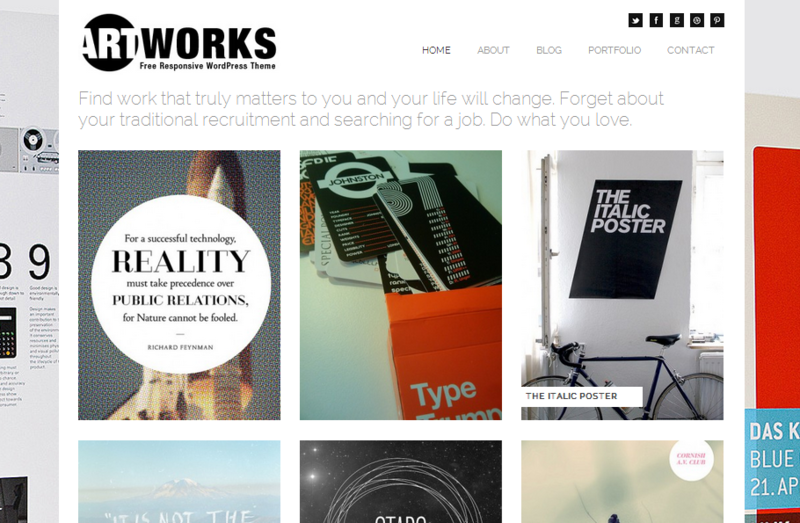 A responsive theme, Art Works ensures that you site is viewed perfectly on every possible device. Showcases content with images well. Free of cost responsive template. Less chance of showing textual content. This is yet another theme which is used to display images properly in the home page. If you are an artist or a photographer, this has to be the theme you are looking for. One thing to note here is that if any post doesn’t contain an image, it would look like an odd one out in the midst of the rest. 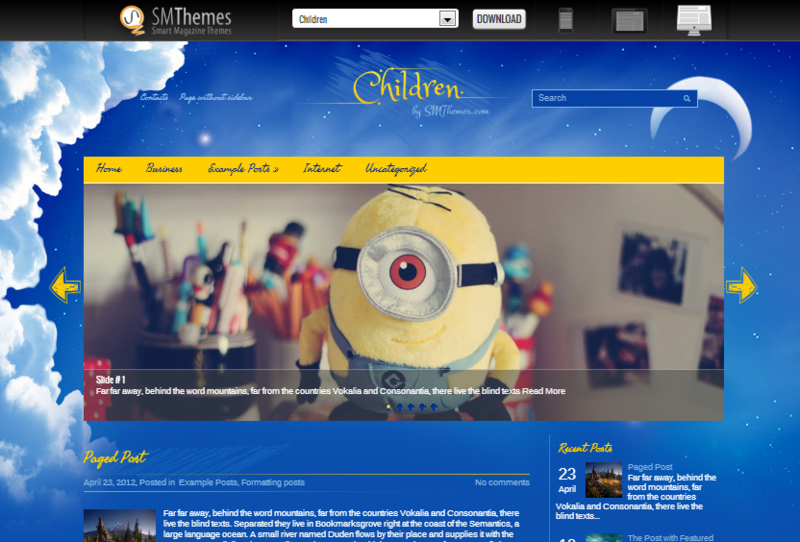 ‘Children’ is a great theme for a blog related to children. It would be perfect for a blog related to cartoons. Its night sky background can be pretty attractive to the young visitors of the site and the curvy fonts add to the appeal as well! A slideshow in the background also adds to the general likeness for the theme. Apart from cartoons, any other content related to tweenagers would look great in this theme. If the prime visitors to your site are going to be ten year olds searching for their favorite cartoon characters, then this is what you should go for.